I’m about to unleash Grace Madison, archaeologist, on the world May 12th via When Camels Fly. Hers has been a long, slow birth. I sat on the plane from Israel last month, reading the e-book proof in all it’s glory. She came alive high about the Atlantic because the prose is streamlined, the dialogue true. I saw what my beta readers have seen: Grace is Everywoman, albeit thrown into dangerous situations, fiercely protecting those she loves, trying to do the right thing with humor and … grace. But backing up a little, I received (the morning I left for the Middle East) the ruthless edit of The Brothers’ Keepers (November 2014) from an assassin thinly disguised as a professional editor. I avoided looking at the file for almost a month, focusing on finalizing When Camels Fly. When I got home, I started the washing machine, made sure the bills were current, and waltzed into The Brothers’ Keepers, which picks up seamlessly where When Camels Fly ends. Three proofing cycles remain on this second in the series. My front-line beta reader; my “read it out loud starting with the last chapter” edit that confuses the old cat who sleeps on one end of my desk; and the pre-proof read-through in late June. Sprinkled throughout the process, beta readers and book club friends and my partner in crime (my adult daughter) and I will be finalizing copy and adjusting characterizations. This ices the literary cake. Then it’s straight into the writing of manuscript three, which pushes toward my frontal lobe as I type. It’s been a good journey. I’ve learned a lot about myself, my writing, and publishing. I’ve met some phenomenal people and professionals. I have (dare I say it?) had a blast. But back to the photo at the top. 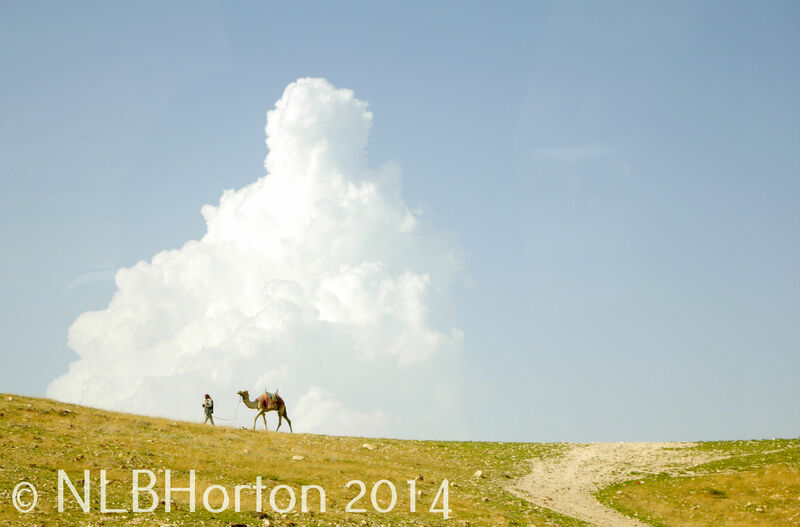 When I saw the man walking his camel across a ridge in the Judean Wilderness last month, I thought, “that’s what I feel like with this fiction writing.” He and I both appear to be taking the long way, and I hope his journey is as fulfilling and exciting as mine. 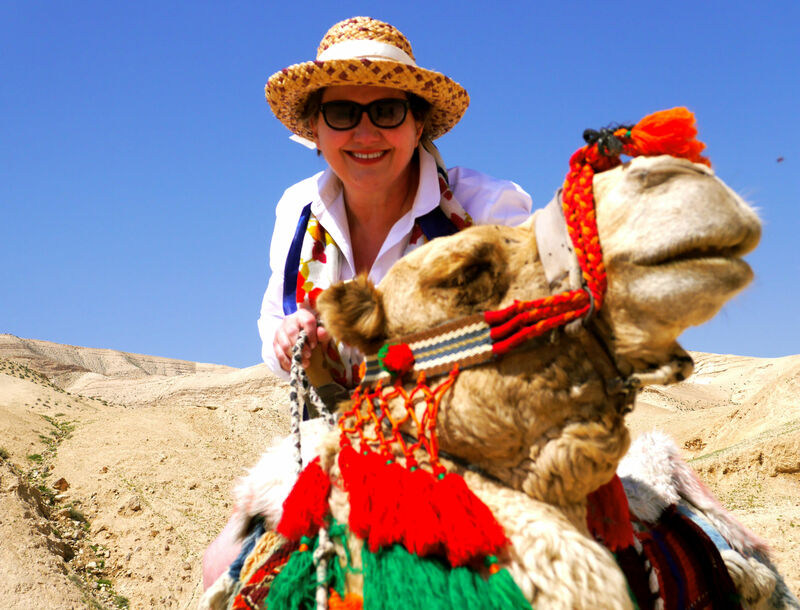 Writing When Camels Fly has been a three-year adventure in an otherwise ordinary and remarkable life. (Yes,both are possible.) Lots of paper has crossed my desk, even more files are buried, like the artifacts my heroine seeks, in my computer. These paperback proofs are being delivered throughout Canada and the States, to bloggers and reviewers who are part of my book release next month. A dozen electronic files went out late last week to those with e-readers. 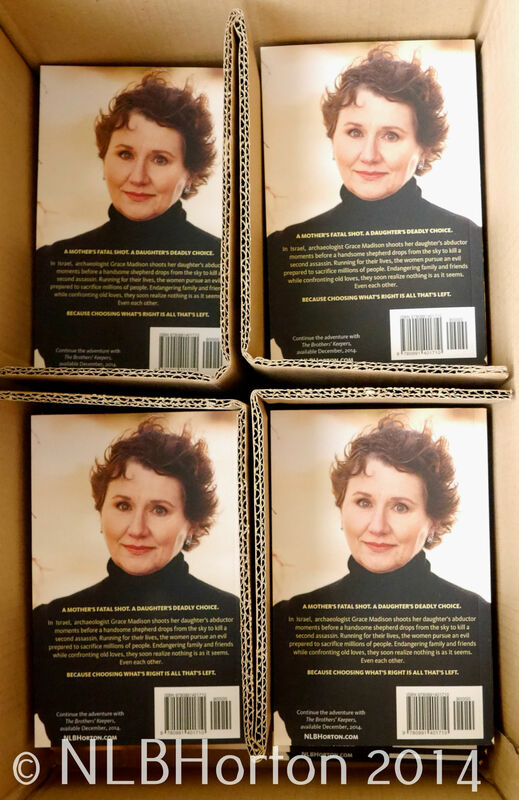 This three-year journey is about to hit the road, and my box of proofs let me know in a hurry how exposed and invested I am. What if I fail? I’ve failed before. What if I succeed? I’ve succeeded before. But if people like, or better yet, relate to archaeologist Grace Madison, her family and friends, what does that mean? It means there’s a voice in fiction for a vigorous, funny, intelligent middle-aged character with a Christian worldview. One who does the right thing, regardless of cost. One who loves her family despite their flaws. One who is unafraid to tackle her demons, fall in love again with her husband, adjust how she parents as her children mature. One unafraid to take a calculated risk when the stakes are high. Grace Madison is Everywoman, as my beta readers and reviewers tell me. 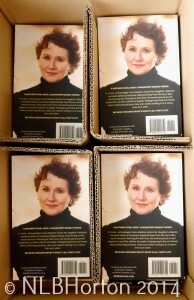 And I’m Everywoman, albeit everywoman who just opened a box of proofs to have an epiphany. Please keep me in your prayers, and I’m glad you’re along for this journey. Camel up! I feel at home in some strange places: one neighborhood in Paris; any drift boat casting a fly on any river anywhere; Cusco, Peru; and the Old City of Jerusalem, for instance. The weather doesn’t matter and life’s activities don’t matter. I am happy to be in these spots every time. 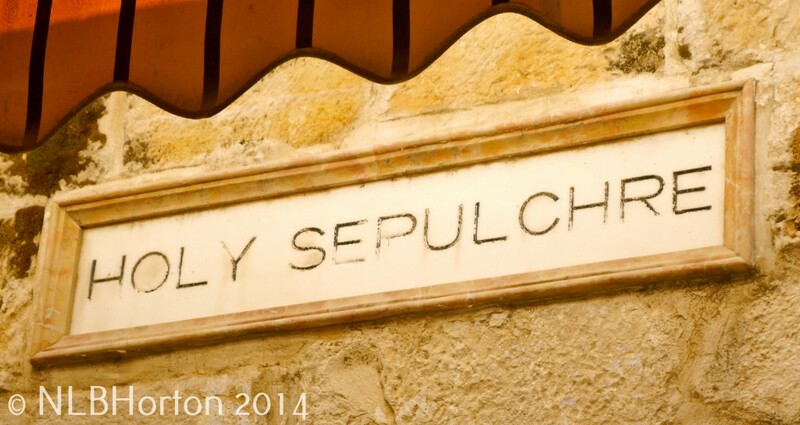 I entered the courtyard of the Church of the Holy Sepulcher in Jerusalem around noon one day the week before last. The bells rang so loudly that I stuck my fingers in my ears (and looked very holy) in a place said to be the location of Golgotha, the hill where Christ was crucified. In all fairness, some scholars say this is the wrong spot, that a crucifixion would have occurred outside the — then — city walls. But I’ll leave that discussion to the theologians. A few Greek Orthodox monks clustered beneath and to the right of the fabled ladder. (You can findmore information about that ladder in the wild-and-crazy conclusion to When Camels Fly, releasing May 12th.) 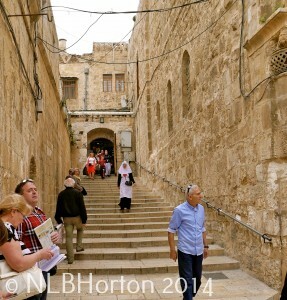 A sister in full black-and-white habit strode firmly down the stone staircase leading to the courtyard from the Christian Quarter, to my left. An orange and white tabby cat lolled on the top step, confident that no pilgrim would dare step on the Sepulcher Cat. For such an important spot, the courtyard is small — less than 150 square feet. Like all of the Old City, it’s an architectural hodgepodge, cobbled together at different times for a variety of worshipful purposes by people from many places. Because of the tangle of passageways and alleys that comprise the Old City, a pedestrian stumbles on the Sepulcher, sitting rather in the middle of the UNESCO World Heritage Site. Even if it’s my destination, I’m always surprised to pop through the arch to it’s right, or descend the stone steps to it’s left, and find myself staring at the basilica facade. It’s a site identified almost two thousand years ago by Helena, mother of the Emperor Constantine. A building that’s welcomed pilgrims for almost a thousand years. Surrounded by a swirl of humanity — Christians, Jews, and Muslims — going about their daily business, working in tight quarters, living life. It’s a remarkable spot, and of those places I feel at home. Every time. Do you have places like this? Where are they, and why are they special to you? I’d love to know. There’s a great deal to be said for a sweet-tempered she-camel like Shushi. Not only is she a pleasure to ride, with an elegant stride and good manners, but she’s the most reliable way to crisscross desert terrain in style. And I love the red tassel on her nose. Camels get a bad rap, like a number of things in the Middle East. But those I’ve ridden have been reliable, comfortable, and cooperative—like most of the Christians, Jews, and Muslims I’ve met. There are good camels and bad camels; gracious and loving people of faith, and narrow-minded and extreme ones. I (independently) visited archaeological sites and wandered the Old City of Jerusalem, where the three religions blend like chunky cake batter. I was part of a group returning to traditional settings important to my faith. As I traveled, my belief that it’s dangerous to paint humanity with a broad brush was reinforced. Each of us can be a person of influence and, like it or not, we represent far more than ourselves. We have a responsibility to build bridges when we can—for our children and grandchildren, if nothing else. 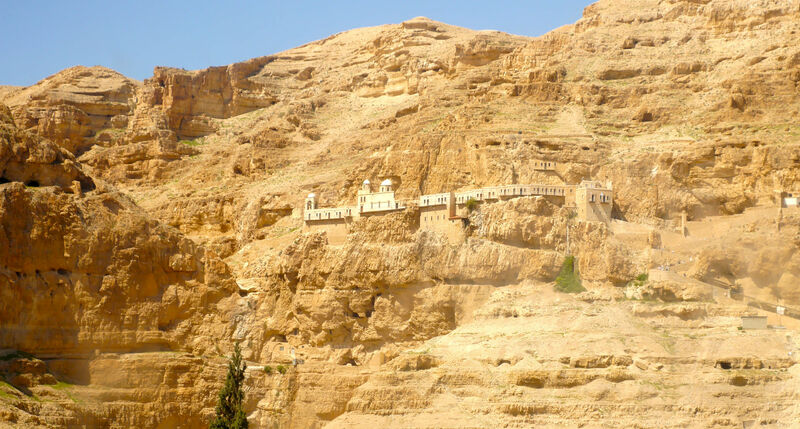 Nothing made these points clearer than my guide to the Monastery of the Temptation, which clings cliffside two thousand feet above Jericho (West Bank). He was courteous, extremely knowledgable, and as professional as any guide escorting me anywhere around the globe. He happened to be a Palestinian Christian, a minority receiving little press. As a non-Israeli, he was lost in the brush strokes of group lectures and discussions; negatively shaded by omission; obscured by political agenda; categorized by lineage; defined by government. With my finest brush, I prefer to depict individuals.